Kaplan Singapore achieved significant progress towards paperless operations by converting 16 IT forms online using Joget Workflow. We have built complex workflow apps that handle multiple approval flows with SLA tracking implemented. 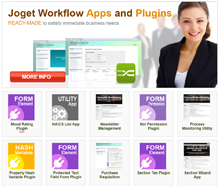 I highly recommend Joget Workflow for any organisations looking for ease of use, rapid development and deployment of online apps, stability, robustness and scalability in a workflow system.